GREAT birthday idea for the kids!! Guaranteed to bring huge smiles. 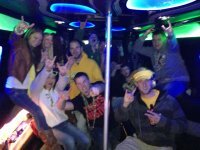 Kids of all ages love to take the stretch Hummer or one of our awesome party buses for a short land cruise. Whether we are taking the group to an activity and back, or just a simple joy ride for 45 minutes, the kids will be very excited. love the atmosphere and will have a great memory. We recommend squeezing in a short activity, for example, stop at a park for cake or go out for pizza. Note: Sorry, no food allowed in the vehicle. Minimum charge is $200 plus gratuity, for 2 hours. Coordinate your group to make the ultimate car pool to the game in one of our luxurious Limo Buses or Stretch Hummer. For the special, the ride leaves at 5:30pm and returns to Fargo immediately after the game (approximately 11:30pm). Bar hopping and additional time can be purchased. Please note, certain vehicles and dates this rate may not be available. Leave 6pm (or after) $575 + gratuity. Take a group out for a stroll and check out the area's best holiday lights! Bring along a bottle of wine and put on the Christmas song playlist! Perfect holiday season outing for all groups and occasions.